If you’ve been searching for a protein that’s versatile enough to be part of any meal, you’ve found it in our Premio Breakfast Sausage. This tender sausage has enough flavor to stand alone on your plate and is the perfect ingredient to include in a wide variety of dishes. From burritos to quiches to casseroles, muffins, tater tots and more, our breakfast sausage makes any meal, side dish or snack great. Ingredients: Pork, Water, Less than 2% of the following: Salt, Sugar, Potassium Chloride, Spices, Natural Flavors. Stuffed in Collagen Casings. Skillet: To keep the great taste and flavor locked inside every link, use a NON-STICK FRYING PAN and TONGS (instead of a fork) when cooking. Place the links in the pan, cover and set temperature to medium heat. Gently brown 15-25 minutes, using tongs to turn often. Serve and enjoy! Oven: In shallow baking pan or slotted broiler pan bake sausage at 375 °F for approximately 25 to 30 minutes, turning once with tongs halfway through. Cook sausage to a minimum of 160° F.
Storing Cooked Links: Cover the links or place in a closed container. Refrigerate and serve within 2-3 days. Methods To Reheat: Microwave: Heat 1 link approximately 1 minute on high or until warmed to your satisfaction (adjust time according to your microwave). Pan Heat: Medium temperature in a covered pan for 5-7 minutes. You have to feed your body hearty and nutritious food to get your day off to a great start. When you do, remember that protein plays an important role in every breakfast. It helps fill you up and keeps you feeling satisfied and full of energy to complete the tasks during your busy day, whether you’re heading to work, school or cleaning the house. Whatever you have on tap, you’ll finish your tasks more efficiently when you’re well-fed and not distracted by a rumbling stomach. Our traditional breakfast sausage links can give you the nutrients you need to get going. With eight grams of protein, our sausage will satisfy you until lunchtime. 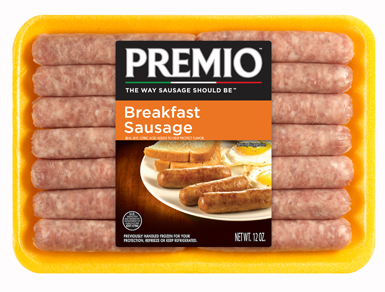 You can feel good about eating Premio Foods traditional breakfast sausage. It tastes great, of course, and it’s made with fresh ingredients. There’s no MSG in our sausages and we never use fillers, either. Our sausage provides the comfort of a familiar taste you’ve loved your entire life. It’s great as the main course in your morning meal. The original flavored breakfast sausages also can be part of any breakfast recipe. Fry up a few and slice them on top of French toast. Add them to an egg casserole. Make a potato hash with eggs and sausage. The list of breakfast possibilities is endless, and they’ll have you ready to take on the day! Premio Foods strives to deliver what our customers want and need. It’s part of the commitment to quality you’ll see in every aspect of our family-owned company. We are always interested in ways we can help our customers. For instance, are you a foodie who loves to find new dishes to cook? You can use our sausage in all the recipes collected on our site, or keep an eye out for contests where we ask customers to submit their own original recipes. We love connecting with our customers over these fun ideas. It’s a great way to see how people use our products and get ideas on how to improve our food offerings for the future. Aren’t sure which stores near you carry our products? Use our convenient store locator to find a location close to your home. You can also purchase directly from our website. Give your family an excellent start to the day with a hearty breakfast featuring our nourishing sausage. They deserve fresh food that tastes good, and you’ll feel good about cooking with Premio Foods sausage.